Sometimes rereading a book you loved works out, sometimes it doesn't. I rarely reread books -- I have too many new books waiting to be read. 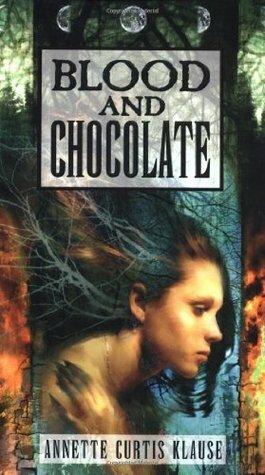 And, in the case of Blood and Chocolate, this is my third time reading it. The first time I read it, I loved it endlessly. However, a friend had read it based on my rec, and he hated it. Years later, I reread it to see if maybe he had been right. I still loved it. This third time reading it, it worked less well for me. I wouldn't at all call it bad, it's just the style of it no longer matched my tastes. The story is about a teenage girl in modern times. A werewolf. Her family/pack gets driven out of their previous home, and they have to try to fit in to a new place. She's beautiful to the point of "all men want her", thought that seems a werewolf trait from as far as I could tell by the story. The book follows her falling in love with a "meat bag" boy -- a non-werewolf, thus "not a person" to werewolf thinking. Though it was a fast read, I stopped at the 20% point. To me, the book was a tad too heavy on romance and high school life, and not heavy enough on werewolves. Currently reading: Count to a Trillion. I'm only a couple pages in, but loving it. The main character's voice has hooked me so hard!